Our aim is to provide a highly professional, tailored recruitment service that meets all present and future demands of our clients. We focus on identifying, attracting and assessing the best candidate in the shortest time possible, without compromising quality. Recruitment consultants are people, not companies, and we have some of the best. 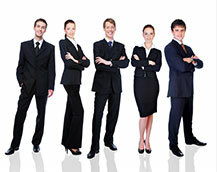 Our Consultants are experienced professionals who have spent many years working in their chosen sector of recruitment.